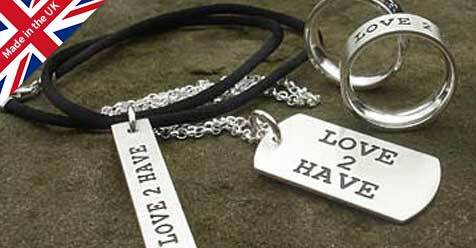 MEN'S JEWELLERY : BRITISH Made : LOVE2HAVE in the UK! The BEST! UK handmade men's jewellery at prices you can afford. Men's jewellery has always been very symbolic, and it seems its symbolism is making a resurgence on our high streets. However, the high streets just cannot cater to everyone's requirements when it comes to supplying specialist or unusual men's jewellery. All of the men's jewellery in this section crosses the divide quite nicely between modern urban and Gothic styling, a fantastic hybrid of the two. Oxidised silver comes into its own here, giving the impression of jewellery that has been worn for a while and therefore taking on a whole new individual look of its own. Men's jewellery was adorned throughout the ages with just one example out of many being the Navaho Indians of America who wore turquoise and silver jewellery to impress the women in the tribe; however, symbolism in jewellery has also been a frequent factor too in the ancient civilisations. Take for example the Celtic cross symbol that defines religion to almost everyone, as probably the most well know symbol worn today as jewellery. Men are finding their spiritual side again, and by shopping online, they can find just what they want. We also stock more organic style men's jewellery that reflects the natural world but in a very contemporary style with excellent examples of jewellery fashioned around the natural world of mountains or coast and make excellent choices for pieces to take on holiday. One thing we have understood from all our years of trading online is that men love their jewellery just as much, and if not more so than women do. In fact, it is not uncommon for guys to own quite a few pieces to mix and match with their everyday wear, depending upon who they are with or where they will be. This also can be said for men's silver rings too, and not just men's bracelets or necklaces. Take a look for yourself, and we are sure you won't be disappointed with our range of designer men's jewellery.